Ciliopathy syndromes result from primary cilium dysfunction and are often associated with premature renal failure due to nephronophthisis. While the genetic mutations that underlie a range of ciliopathies have been identified, the link between these genes and disease phenotypes remain elusive. Mutations in the gene encoding the large centrosomal protein CEP290 are associated with several ciliopathies, including Joubert syndrome (JS). CEP290 localizes to the centrosome and the base of the primary cilium; however, it is also found within the nucleus, where its function is largely unknown. Gisela Slaats and colleagues at the University Medical Center Utrecht have demonstrated that loss of CEP290 induces DNA damage response signaling, DNA breaks, and replication stress in the kidney. Compared to cells from a healthy donor, renal epithelial cells isolated from a patient with CEP290-asssociated JS had increased DNA damage signaling and decreased CEP290. Moreover, CEP290 depletion in human and murine renal cells as well as in zebrafish embryos increased DNA damage and signaling. Primary kidney cells from CEP290-deficient mice had increased generation of double-stranded breaks in DNA, were more sensitive to replication stress, and exhibited excessive centriole development, indicating that CEP290 is critical for genome stability. Moreover, cyclin-dependent kinases (CDKs), which are known to induce replication fork errors, were elevated in kidney cells from CEP290-deficeint mice, and treatment of these cells with a CDK1/2 inhibitor reduced DNA damage and rescued ciliation. Together, the results of this study reveal that DNA damage and replication stress underlie pathogenesis of CEP290-assocaited renal ciliopathies and that CEP290 contributes to genome stability. 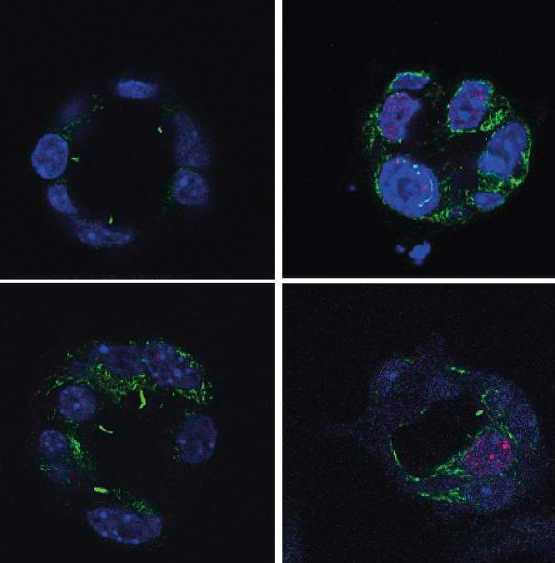 The accompanying image shows 3D spheroids of kidney cells from WT (left) and CEP290-deficient (right) mice treated with DMSO (control, top) or a CDK1/2 inhibitor (bottom). Compared to WT cells, CD290-deficent cells have increased DNA damage (γH2AX, red) and decreased ciliation (acetylated tubulin, green). CDK1/2 inhibition reduces DNA damage and restores primary cilium in CD290-deficent cells. Citation Information: J Clin Invest. 2015;125(9):3657-3666. https://doi.org/10.1172/JCI80657. Juvenile ciliopathy syndromes that are associated with renal cysts and premature renal failure are commonly the result of mutations in the gene encoding centrosomal protein CEP290. In addition to centrosomes and the transition zone at the base of the primary cilium, CEP290 also localizes to the nucleus; however, the nuclear function of CEP290 is unknown. Here, we demonstrate that reduction of cellular CEP290 in primary human and mouse kidney cells as well as in zebrafish embryos leads to enhanced DNA damage signaling and accumulation of DNA breaks ex vivo and in vivo. Compared with those from WT mice, primary kidney cells from Cep290-deficient mice exhibited supernumerary centrioles, decreased replication fork velocity, fork asymmetry, and increased levels of cyclin-dependent kinases (CDKs). Treatment of Cep290-deficient cells with CDK inhibitors rescued DNA damage and centriole number. Moreover, the loss of primary cilia that results from CEP290 dysfunction was rescued in 3D cell culture spheroids of primary murine kidney cells after exposure to CDK inhibitors. Together, our results provide a link between CEP290 and DNA replication stress and suggest CDK inhibition as a potential treatment strategy for a wide range of ciliopathy syndromes.